Custom Post Types are a great way to structure your data and also to provide an interface for an end user to easily populate data as in any content management system. There are WP plugins available for download that can create and manage custom post types but you can also follow WordPress functions and do it yourself. Creating Custom Post Types for a Genesis Child Theme is pretty much like any other WordPress theme, these custom post types can be created in your functions.php file of your child theme or you can create them with your own plugin. 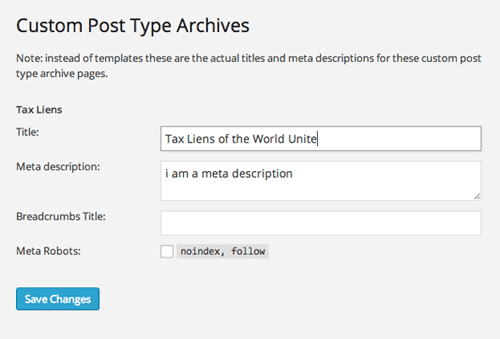 The custom post type is created with a function and action in the example below we are creating a new custom post type for a fictitious Tax Liens company which essentially require a custom post type that will be used to store various details of Tax Lien offices. In the function part of the code beneath the function name create_custom_post_type we have a number of arguments passed to the new custom post type with the above being the bare minimum to get the post type up and running, there are 2 main arrays of arguments the labels array give the custom post type a singular and plural name, whilst the args array is the main array that also contains the $labels variable, then has the public argument makes it show front and back end and allows the post to be searched on and has_archive gives it an archive. The rewrite argument and array gives the ‘slug’ url a term that will prefix the custom post URL similar to how a category would. This will be the URL which will display the archive listing of all the same custom post types content similar to the blogroll. It’s not compulsory but makes sense to do so as this is logically structuring the data. Below the $args array but within the same create_custom_post_type () function we are using a WordPress function called register_post_type to register the new custom post type and calling it tax_lien as well as registering all the arguments that go with it by expressing the $args variable. 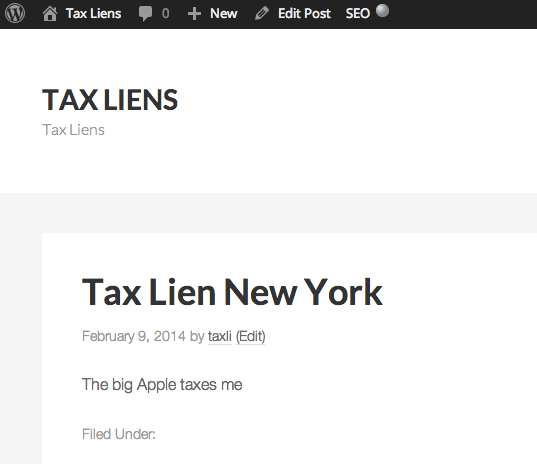 With this in place we will now have a custom post type in the WordPress dashboard. At this stage we can now populate our Custom Post Types by creating new ones and adding content similar to a regular post. single-tax_lien.php and archive-tax_lien.php the latter half of the template name taken from the register_post_type function declared as the first argument earlier. You may now need to re-save your permalink structure for the new templates to be recognised and appear, Settings > Permalinks, just go there and click save. Now your custom post types will show in the front end as well as the archive listings under the custom slug set earlier. The ‘menu-icon‘ will add a CSS class that you can target to add in a custom menu icon. 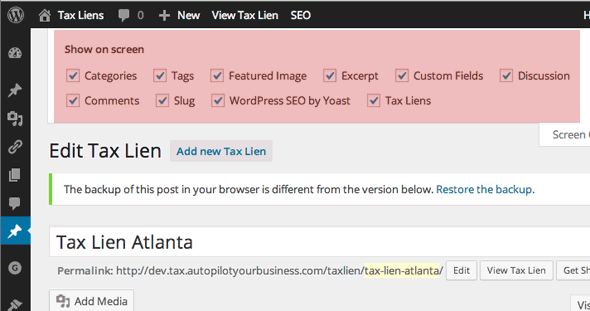 taxonomies can set up a categories and tags section for that custom post type. supports allow for fields and meta usage similar to regular posts but they must be explicitly set for custom post types. So the function is declared with 2 arrays, then registered with the args array which contains the labels array, the function is initialised with the action. The Yoast WordPress SEO meta box is enabled to the custom post type without declaring it in the supports array, this will work fine in the single posts but in the archive if you want the Yoast SEO settings you’ll need to pay a trip to the Titles and Meta part of the plugin and look for the new custom post type for which there will be controls for the single and archive pages. One of the supports specific to Genesis is genesis-cpt-archives-settings when this is enabled you get Genesis theme setting control over the new archive template including layout, description, body class. 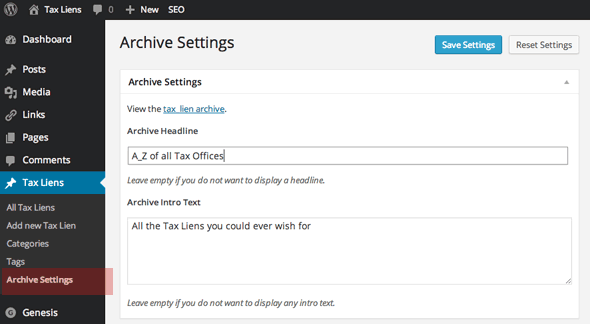 It also includes SEO settings but if your using Yoast then see the previous text. One issue with writing the custom post types in the functions.php file is that if the theme is changed the functionality is lost as a functions.php file is theme dependent whereas a plugin is not. All thats needed is to copy the custom post type code and paste it into a plugin file. Just paste in your custom post type code underneath and save and then activate the plugin in the dashboard. This code is a plugin to create a Custom Post Type in WordPress, it can be used with any WordPress theme. The action initialises the function below it. This example uses the term 'Testimonials' as its name, a search and replace will allow any name to be used, making sure plural and singular versions of the name are replaced. Also replace the name in 'rewrite' and in the 'register_post_type' function. // First, we "add" the custom post type via the above written function. // when you add a post of this CPT. This example uses the term 'Events' as its name, a search and replace will allow any name to be used, making sure plural and singular versions of the name are replaced. To change the menu position of the custom post type follow this guide.